Beginning with Allan Bloom’s The Closing of the American Mind, published in 1987, higher education has been under scrutiny. More recent questions have been raised by Naomi Riley’s 2011 critique of tenure and the harm it does to higher education, The Faculty Lounges and Other Reasons You Won’t Get the College Education You Paid For. Bruce Bawer joins the fray with The Victims’ Revolution, exploring the ways identity studies have debased modern education. He focuses on four major areas: women’s studies, black studies, queer studies, and Chicano studies. Mr. Bawer sets the stage for the discussion by looking at the writings of the noted historian Arthur Schlesinger, Jr. In his book, The Disuniting of America (1991), Schlesinger argued for the preservation of the values that built the United States and yet were under attack by intellectual relativism and the fixation on group identity. Assessing a statement not on the basis of its truth but on its potential offensiveness to a specific group has become a way of life fostered and developed by practitioners of identity studies. The Victims’ Revolution is not a dense scholarly analysis of identity studies, replete with tables and graphs and references to obscure journals. Mr. Bawer engages in more of a narrative, based to a great extent on visits he makes to different conferences, supplemented by references to writings of the participants. He does find some common themes in these presentations, focusing mainly on the role of the oppressed. One common theme is the subjugation of the target group by white males. The author contends that women are suppressed by males who are all portrayed as potential rapists and enemies of the female gender. Blacks are suppressed by a white attitude of colonialism that expects African Americans to behave like whites and communicate in a white fashion, thus denying them the freedom to express themselves in alternate ways (such as Ebonics). Chicanos have had a great civilization and country stolen from them (by whites, of course). In each situation, the designated group is exploited and denied their freedom and rights. Mr. Bawer points out the falsehoods that define and are endemic in these assertions—especially in black and Chicano studies. He asserts that both groups teach a history that holds up some mythological past great civilization supposedly superior to the present’s. He shows that there is no evidence for such a civilization in African countries. The myth of Egyptian culture transforming Europe is shown to be just that—a myth. Tales of the benign, gentle civilizations of the Aztecs and others are wrong when we look at the massive cruelties and slaughters inflicted during religious sacrifices. Part of Mr. Bawer’s criticisms focus on the lack of education demonstrated by Ph.Ds in these fields. He cites numerous instances during the presentation of papers in which the speaker either misuses or mispronounces words. He also criticizes the jargon employed and the difficulty in coming to a common understanding of terms. Unlike the “hard” sciences, in which terms like Boyle’s Law or the idea of momentum are understood by everyone in the field, language in identity studies is convoluted and vague. What Mr. Bawer fails to bring out clearly is that this situation exists in the humanities and social sciences in general—it is not limited to identity studies. As a homosexual activist, Mr. Bawer does not offer the same insightful critique of gay studies, preferring to focus on “queer studies” (which appears to be just a highly politicized subset of gay studies). While rightly condemning the violent rhetoric and action emergent in other identity groups, he ignores the violence, physical attacks, and property damage inflicted by homosexuals upon anyone who disagrees with them in any way. His own advocacy blinds him to the shortcomings he easily points out in other identity groups. Near the end of the book we are given brief pictures of less well-known identity groups, such as cultural studies, disability studies (not from a physical standpoint), fat studies (looking at prejudice against fat people), and men’s studies (or male studies) which is taught from a feminist perspective. What is the solution? Mr. Bawer ends on a somewhat pessimistic note. He sees changes taking place, but is not overly optimistic about further progress. He encourages parents to be more aware, even in the top universities. Starting new programs (and new schools) may be a way to turn things around. The eventual solution may be economics. With more and more students graduating with high student loan debt and worthless degrees, students and parents alike should ask the hard questions about what exactly is going on in higher education. 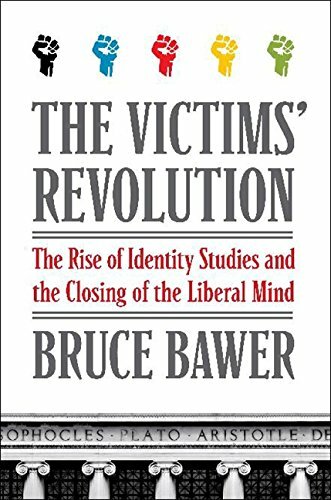 The Victims’ Revolution: The Rise of Identity Studies and the Closing of the Liberal Mind may provide a useful place to start.